About Adrian R. Message Adrian R.
Adrian was an excellent guide. He was prompt, friendly and knowledgeable. Despite the weather he made sure we had a great day! TOUR GUIDE RESPONSE: Dear Lynn and Kenneth, Thank you for being on my tours. It was very nice travelling with you. Best wishes! Adrian is an extremely knowledgable guide. Highly recommended. Thank you Adrian. TOUR GUIDE RESPONSE: Dear Melissa, Thank you for your feedback and our great time together during the tour. I left a message with Daniel, too. He will tell you about it. I will also try to send it to your phone. Best wishes, Adrian. We thoroughly enjoyed our-five day individual guided tour of Romania organized through Tours by Locals. Our guide was very professional and demonstrated a deep knowledge and love of his country. Although our itinerary was arranged ahead of time there was a lot of flexibility to modify it keeping in mind that we needed to reach a destination point and our hotel each day. A very interesting and educational trip with some spectacular scenery along the way. We highly recommend it. A.
Adrian is one of the best guides we had. very prompt and thorough in email responses, he managed our expectations very well. on tours, he provided very practical recommendations, and is very conscious on how to maximize the tours and sights so that we can we get the most of our visit. He is well versed in history as well. Highly recommend Adrian! TOUR GUIDE RESPONSE: Thank you so much for your generous feedback! Best, Adrian. Adrian is a remarkably knowledgeable fellow with an undimmed passion for his work. Courteous and competent, he gave much more than expected. Thank you for two days of wonderful touring. You were so informative, kind, patience with my slowness in walking, and helpful. Great guide. Adrian took four of us on a very interesting two-day discovery of Transylvania. The arrangements for the tour were clear and thorough, and he delivered on each commitment. His vehicle was perfect for our small group. He made sure that we saw as much as possible and his commentaries in the car were most interesting. When we stopped he guided us, made sure we saw as much as possible and gave us in depth information. Thank you Adrian for your attention to detail and for introducing us to Transylvania. This was an excellent tour from every point of view. It even exceeded our expectations. Our guide was very knowledgeable and informed about all the sites we visited. He made excellent suggestions for additional sites. He was punctual, courteous, considerate of our wishes and always very helpful. We came away with a good knowledge of Romania and its people, not just Transylvania, which was the focus of our tour. We would not hesitate to ask Adrian to be our guide again. Adrian was simply outstanding. His professionalism and knowledge made us quite comfortable in such a large and congested city such as Bucharest. We were so glad to have met and worked with him...we gained insights and knowledge that no travel book or brochure could possible provide. If there was a six star rating than it would apply to him. Very nice tour. Our guide was excellent, and very patient. We travelled with our two young boys (soon 5 yrs and 2,5 yrs) and it was very tough. Probably not recommend travelling with children at that age on a tour like this, but the tour itself was very interesting. We have only nice things to say abour our guide. Romania is a lovely country but when you have a great guide like Adrian Rusu the experience would be exceptional!!! Adrian tailor made a 6 day tour for us and included the highlights of Bucharest, Brasov, Sibiu and Sighisoara as the main stays whilst exploring other places on our way. Would recommend this guide to anyone visiting Romania as he is extremely well informed about anything!!! Adrian is almost as interesting as the city itself. He was so incredibly knowledgeable of everything we saw and had some interesting personal anecdotes about Romania and the city. Definitely one of the best tours I've ever been on. I HIGHLY recommend! Adrian's friendly, welcoming personality and energy radiated from the moment he greeted my travel companion and me. He showed up on time. Adrian is very intelligent and knowledgeable in regards to Romanian history, the castles and places we had visited. He was informative, yet listened enough to know when we had enough of history. He was able to answer all of our questions without any hesitation. Throughout the long day, he made sure we were comfortable. In regards to the tour itself - highly recommend. Adrian is the man! He was very knowledgeable, organized, fun and professional. Even though the trip to Transylvania was a day-long and very tiring tour, he made sure I got the full experience out of it. Thanks Adrian! Adrian gave a great tour of the countryside of Romania. We enjoyed the salt mines and how huge they were. I still can't get over how impressive they were. Michael really enjoyed the winery and can't wait to open up the bottles we purchases. The tour was beyond our expectations. You were an excellent guide. Over all it was a fantastic day. Transylvania is spectacular and Adrian is a 6-stars tour guide. Based on our travel experience in Transylvania, we think a tour guide is highly recommended and indeed needed especially if you want to see local villages and faraway places. Transylvania is absolutely a travel delight, and Adrian's guided tour enhances the travel experience. We only had one day in Bucharest and Adrian really made it count with this tour. He was very knowledgeable about the history and culture of Romania, and we enjoyed his stories of his own experiences. Adrian was great. His English was perfect and knowledge of history of Romania and buildings of Bucharest informative - and at the right amount of info that one will remember. We asked for some different stops than his usual tour and he gladly did that and fit in our long list. He clearly also researched some of the places we wanted to go that he had not been before. Driving and attempting parking on our own would have been impossible. Worked out perfectly for us. Adrian was great, we have thoroughly enjoyed our tour with him & highly recommend him!!! Amazing tour - Included sites and well as several long hiking adventures. Exceeded my expectations in every way - Highly recommend. Adrian was a great guide, more like a friend. He is passionate about the country and very knowledgeable and flexible to adjust to your needs. It was a pleasure having him as our guide and I would definitely recommend him to anyone. Adrian was very personable and took great care to cater the tour to our needs. My mother uses a wheelchair at times and he was very patient and helpful with ensuring we were as mobile as possible. Highly recommend him. I was a great day, I really liked the Village with the history of Homes from the 18th and 19th Century. Romania is my native country but without booking a tour I will not know the hidden treasures which is hidden. Adrian was just the perfect tour guide, full with knowledge and I would recommend him with no hesitation..
Adrian was an excellent driver, historian and tour guide. Very nice experience in Transylvania! It was a very pleasant trip travelling with Adrian. He went out all the way to make sure our time in Romania was a memorable one. He is very attentive to details and cater to all of our needs in Bucharest and willing to accommodate additional and impromptu requests. He is an extremely good guide and would give you great historical and lifestyle information of Romania and Romanian and ever willing to share his own experiences as well. Highly recommended, you will not regret it travelling with him. Our guide Adrian was extremely knowledgeable about all the locations we visited. Even on the long journeys he would point out places of interest and share information about them. I was rather impressed with the amount of information he provided. At the end of each day, we asked Adrian to recommend a restaurant for us to have dinner before returning to our hotel. Everyone in the group (family of eight) were satisfied. Adrian was always on time, courteous and helpful. I would highly recommend him + company. TOUR GUIDE RESPONSE: Dear Indira, it was one of my most enjoyable tours. You have a wonderful family and I felt privileged to be your tour guide. Adrian is the guide to have if you want to know all about Romania past and present. He is patient, tireless and usually able to do the impossible like finding convenient parking spots when there appear to be non available, getting smiles from dour faced policemen and finding an answer to every conceivable question or request. He is multi-talented and actually quite inspirational with his love of Romania and the coping strategies he has developed to lead a satisfying life in rather trying conditions. Fantastic place to visit! Was picked in Bucharest for a few hours drive up to Slanic Prohav. You are then driven through the active drives into a massive public gallery some 200m high. Massive folded sequences line the walls, entirely salt. A geologists dream! haha. For non geos is quite awesome too. You feel as if you've stumbled into a Lord of the Rings film. You can wander through at your leisure, have a sleep, take coffee and even play billiards, as Deep Purple or Elton John echo through the air. Fantastic tour with a wonderful guide. Adrian is very knowledgeable friendly and more than helpful. My husband is partially handicapped and with his help we were able to climb the Citadel & Bran Castle. We could not have accomplished this without him. He took us to wonderful restaurants and showed us a beautiful country that we would like to return to. Adrian exceeded our wildest expectations. For us this was day 3 with Adrian and another fun day. The salt mine is unbelievable, the wine superb and the muddy volcano the "Old Faithful" of Romania. 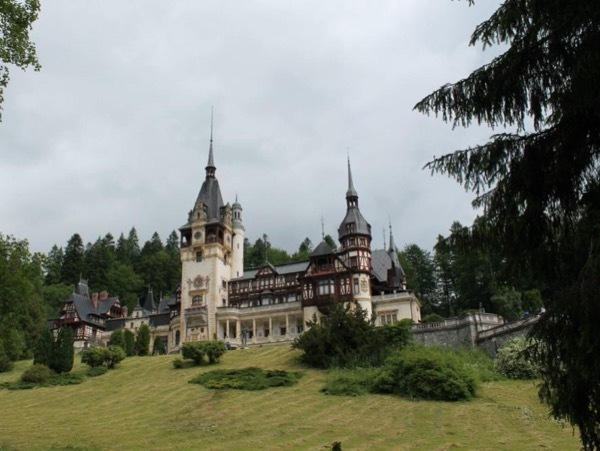 These are not places you would get to see on an ordinary tour but add to the flavor of Romania. Another 5 star day for Adrian, a wonderful gentleman who truly loves what he does. Adrian was a wonderful host, fully knowledgeable, extremely friendly, very eager to ensure all of my needs were met. I will definitely book another tour with him. Excellent tour guide. Very knowledgeable of the history facts of the places we visit. Very accomodating to our requests to stop for lunch, to take pictures, to grab a cup of coffe, assist us taking pictures. He has a basic knowledge of Spanish. Excellent service. We definitely book his services in a future trip. Adrian was SMART, KNOWLEDGEABLE and FUN! We had a terrific time Adrian. You were worth every cent of the tour, and we hope to come back and tour with you again. Adrian is wonderful, and I doubt there is a better choice. Prior to my trip, he spent a lot of time communicating with me, and helping to plan an itinerary that catered to what I wanted. He has such patience and calmness, that you feel you're in good hands at all times. Personally, he is an open-minded, kind, and interesting person. You will enjoy conversations with him, because he shares many stories/legends about Romania. He is also intelligent and versed on many topics. You will not be disappointed! Adrian, was by far the best guide we have ever had in 50 years of traveling. Couldn't be better. Everyone needs to have Adrien by their side for any visit to Romania. We were so well informed about this fabulous country. This man knows his country, history and politics. Thank you Adrien. And a fantastic driver! A great guide. He is enthusiastic and willing to go off the beaten track. I highly recommend Adrain. Adrian picked us up from the cruise port in Constanza, and gave us an excellent two day tour. We stayed overnight at the Epoque hotel (highly recommended). Adrian was an excellent guide, and gave us much insight into Romania and its people. If you want to escape from your cruise ship for a couple of days, there isn't a better way to do it! Adrian is a very good guide, very knowledgeable, energetic, pleasant, punctual. I'l highly recommend him to my friends. Our guide were very good informed by the history of Bucharest. Very friendly and came up with good ideas for a self-created tour around Bucharest. We will surely use the same guide, if we come to Bucharest Again. Thank you for at great service and experience. TOUR GUIDE RESPONSE: Thank you for your feedback. It was very nice spending the afternoon together. I feel I was very fortunate to meet your family. You are all wonderful people. Adrian is the best guide ever. Very knowledgeable, energetic, and trustworthy. Highly recommend! The BEST wine tour I've ever been on, and I live in Italy! ;-) Wines were great, hospitality was amazing. Highly recommend! We had a really lovely day. The salt mines were a real experience and I enjoyed travelling down in the lift as the workers would have done.I did not think the mine would be bettered but then we went wine tasting a truly amazing time. The weather was a little unkind, but our guide Adrian, thought of everything and supplied Wellington boots to wear at the mud volcanoes part of tour. All in all a great time. Would recommend everyone to try this tour and company. Adrian is a phenomenal tour guide who will cater to the tourist's needs. My mother and I were surprised when he took us to the winery. Beautiful place and very relaxing. That was probably the best wine I've tasted as it wasn't strong like other wines I've tasted. The Salt Mine and Muddy Volcanoes were great experiences as well. These were also great learning experiences. Adrian will take great care of you during the tours. We traveled to Bucharest for a conference and were fortunate to book a tour with Adrian. It was our first visit to Romania (but likely not our last!) Adrian shared his knowledge of Romanian history and culture throughout the day. All three sites (the salt mine, winery, and mud volcanoes) were fascinating and well worth a visit, and the transit between was filled with pleasant and interesting conversation. Romania is a beautiful and complex country, and we HIGHLY recommend Adrian as a guide. It is not possible to go wrong with Adrian as your tour guide. When we went to the winery, it was an extremely wet and rainy day. We got stuck in the mud, not before some excellent driving and attempts to make it up the hill though! He calmly called the winery and they brought the tractor to pull us up the hill. The winery itself was state of the art and I learned so much. The salt mine is amazing, as are the mud volcanos. If you have a free day in Romania, you do not want to miss this tour. Very knowledgeable on a variety of topics and extremely accommodating to unique and changing circumstances. He can assist you with just about anything you might need assistance with in Romania, in addition to your tour. I highly recommend him. This tour was awesome! The salt mine was such a unique tour and it was beautiful. Many of our friends who have traveled to Bucharest were surprised to find out that a tour to a salt mine was available. I have since referred them to Toursbylocals. Adrian was the best tour guide ever. He was punctual, very courteous and knowledgeable about the area. He made contact with us prior to our tour to find out if we needed anything. Not having been to Bucharest before, it was great to have someone there to help. Adrian was a great guide and, more importantly became a friend by the end of our trip. He is insightful, flexible and will to persevere to ensure a great experience in Romania - a country he is clearly and justifiably proud of. In our case, he catered to our desire add additional wineries in place of the mud volcano and went above and beyond the call of duty to make sure we got what we wanted. In short, we will return to Romania in the future and will definitely be in contact with Adrian! Adrain was an excellent tour guide. I would highly recomend him to anyone I knew was traveling to Bucharest.